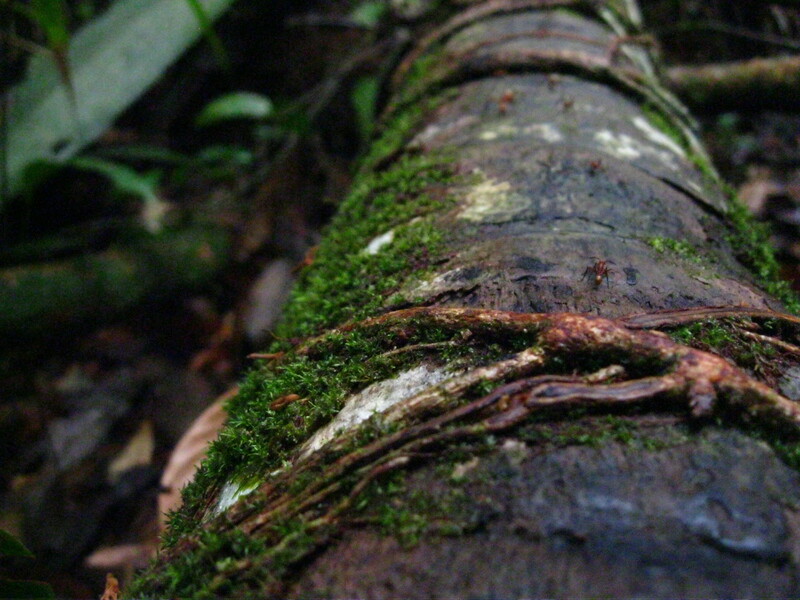 Army ants are abundant in the tropics, and here at La Selva you will probably see them every day if you walk more than a kilometer or two on the trails. 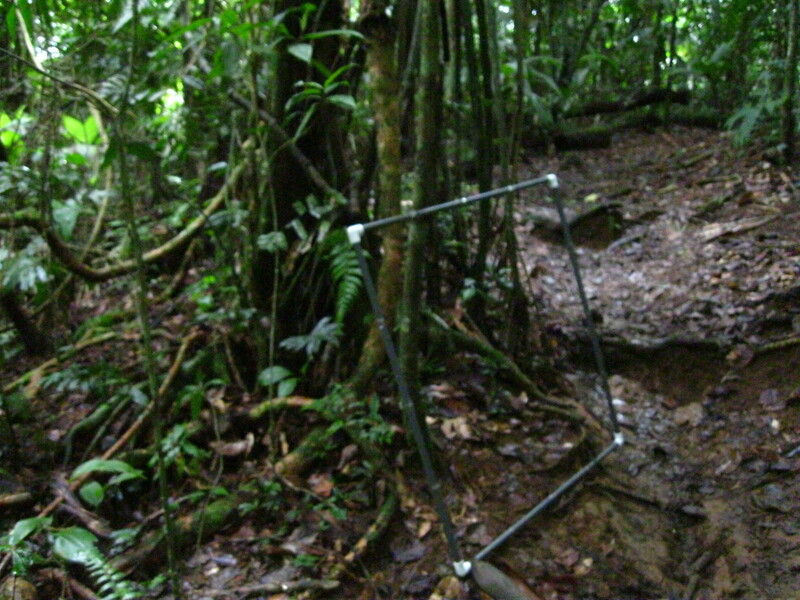 This is the trail to my field site where species of Eciton frequents. 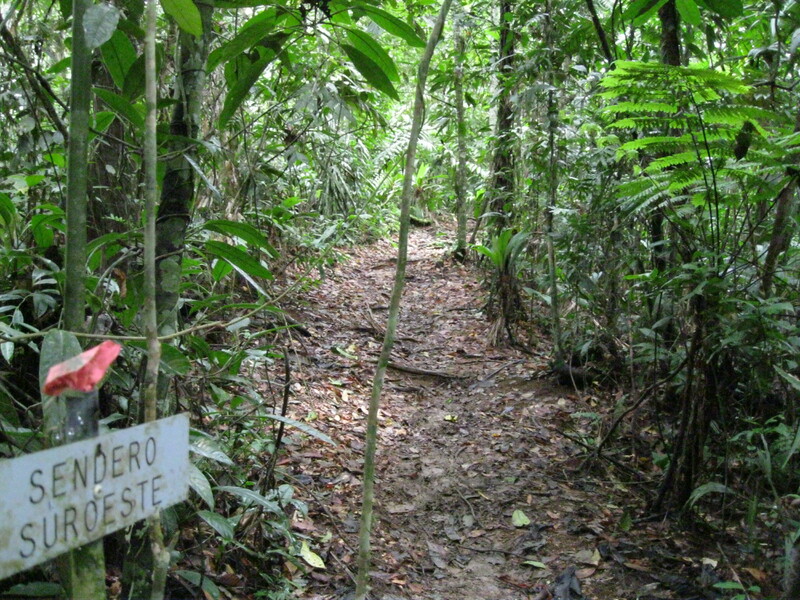 I have tried to follow their trails into the forest before, but it usually becomes too thick with undergrowth. 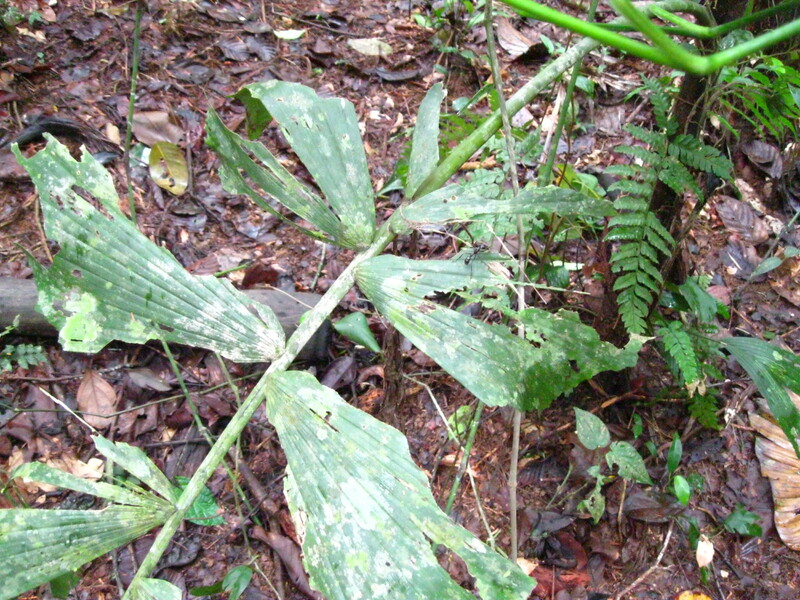 I have also collected Labidus and Nomamymex in this area. 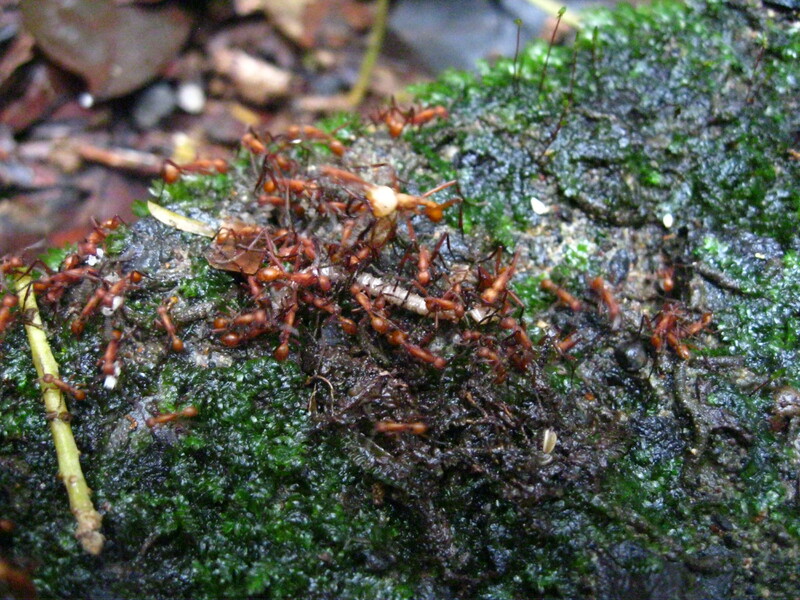 This trail was quite conspicuous as the ants were carrying prey brood across the trail. To find the bivouac all that needed to be done was to follow the trail in the direction of the brood… for less than one meter. With the bivouac found, I decided to follow their trails and see what their raid front was like. 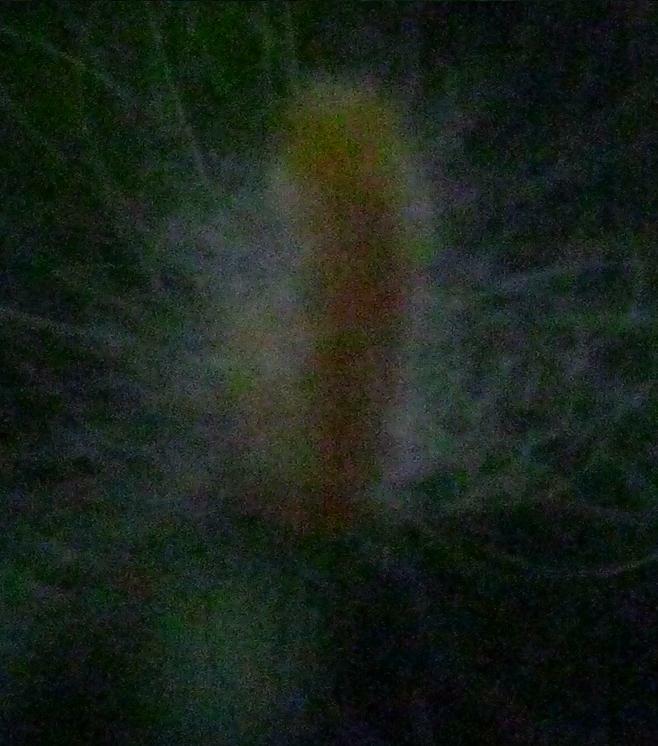 When going through the undergrowth, one must be constantly aware and on the look out for snakes and the bullet ant among other things, such as this fuzzy dangling caterpillar. I followed the trail along logs, over logs, through logs and once under a log, fun stuff. 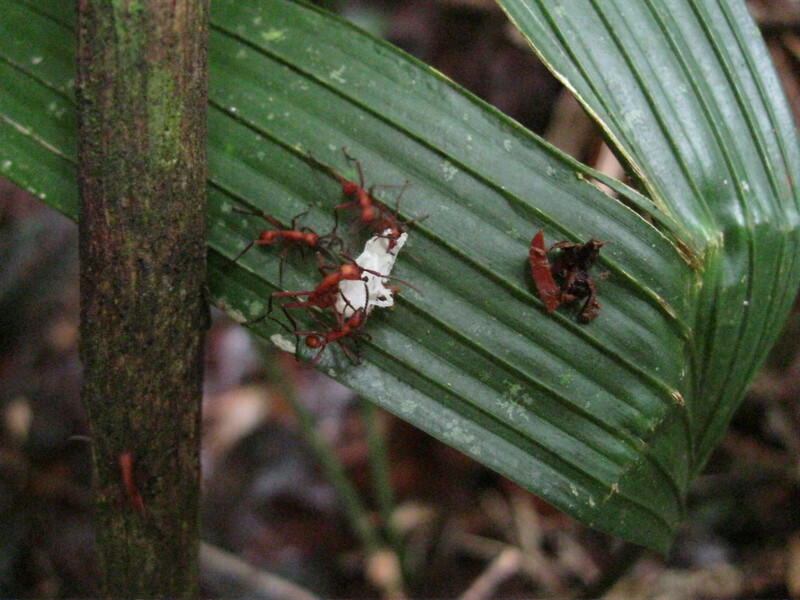 These army ants Eciton hamatum or Eciton lucanoides have only one eye facet and as such are only able to sense the amount of light with no directionality. 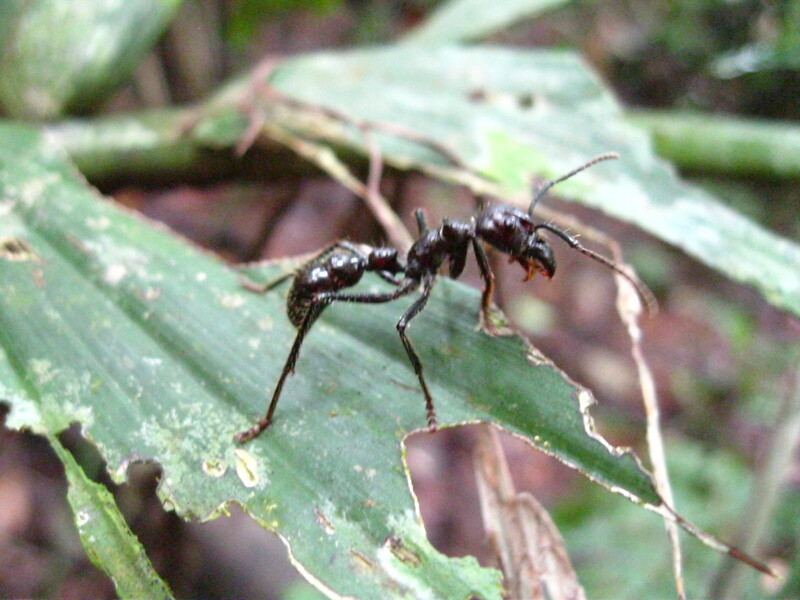 They can only communicate with smell (If there is evidence of any tactile communication in these ants please provide it) which is why their antennae move so rapidly about. Innevitably when coming into contact with the flora, creatures will get onto you. Thankfully this time it was just a Cephalotes cristus. 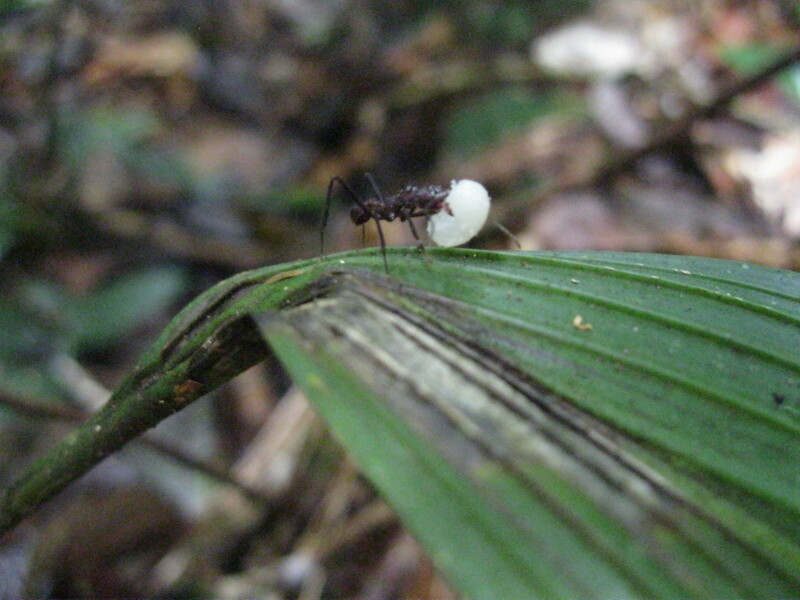 It could have just as easily been the bullet ant aka Paraponera clavata fabled for its powerful sting. Coming to the raid front I find this scene. 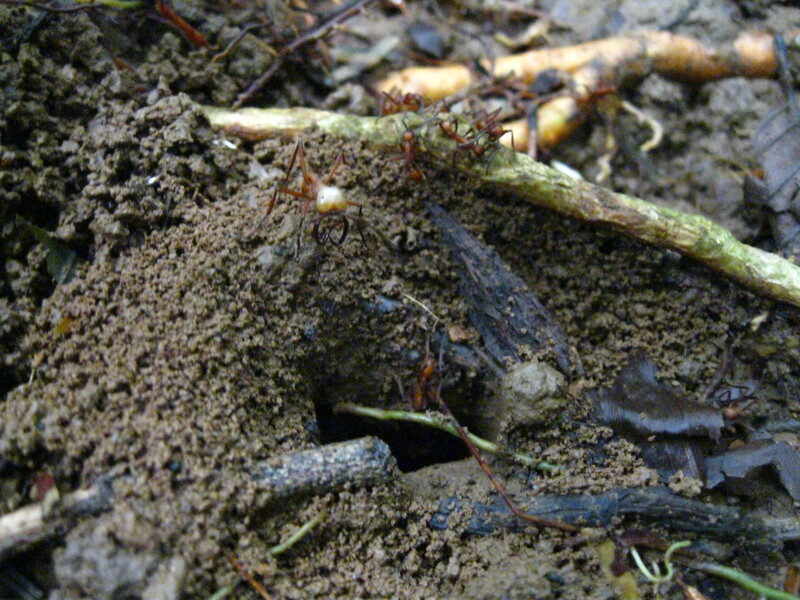 A “soldier” ant stands at the entrance of the nest of some creature. Unfortunately I did not see them carry out any brood. 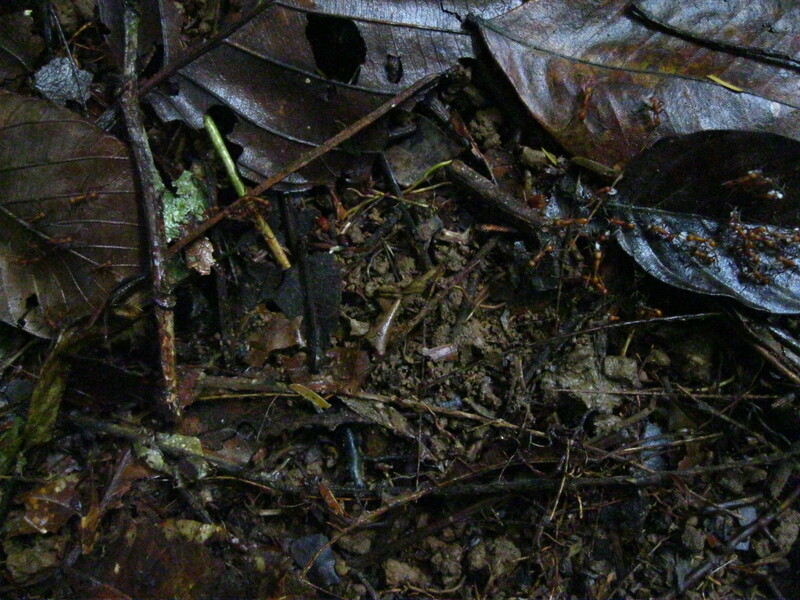 The army ants were swarming this small patch of litter next to the walk way where the photo was taken. I observed them here for ~15 minutes. When the swarm subsided and they moved on, I looked into the litter and saw many small ants running around. Turning over a random leaf revealed a small colony (fragment?) 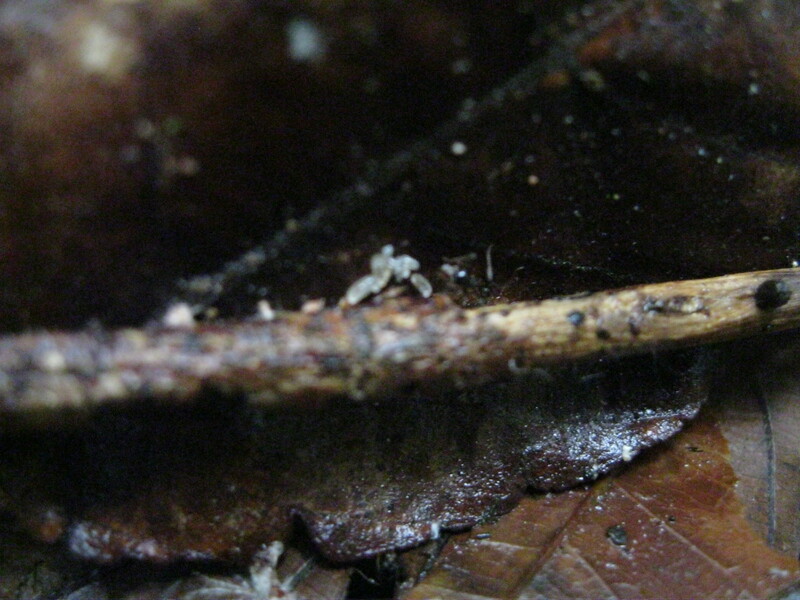 of Pheidole hirsuta. with brood. Here an Acromyrmex octospinosis. 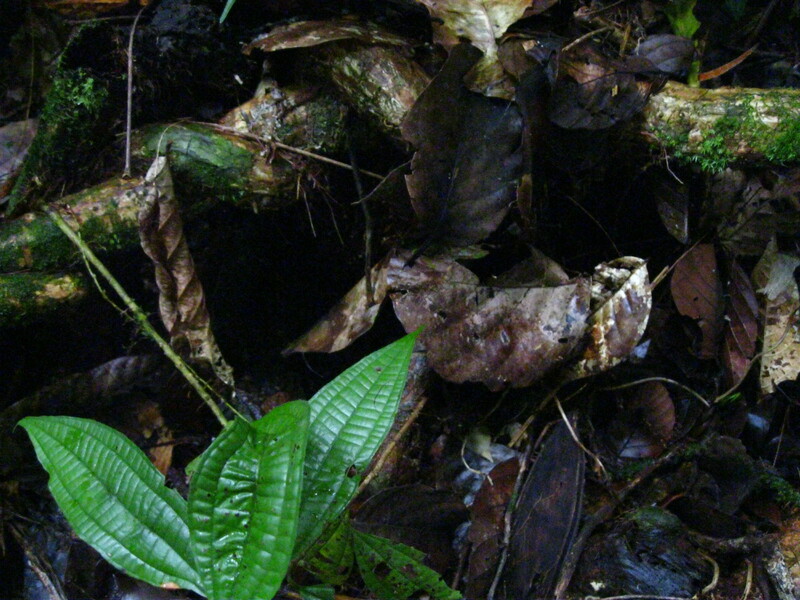 carries its brood up the vegetation in order to escape the incoming army ants. 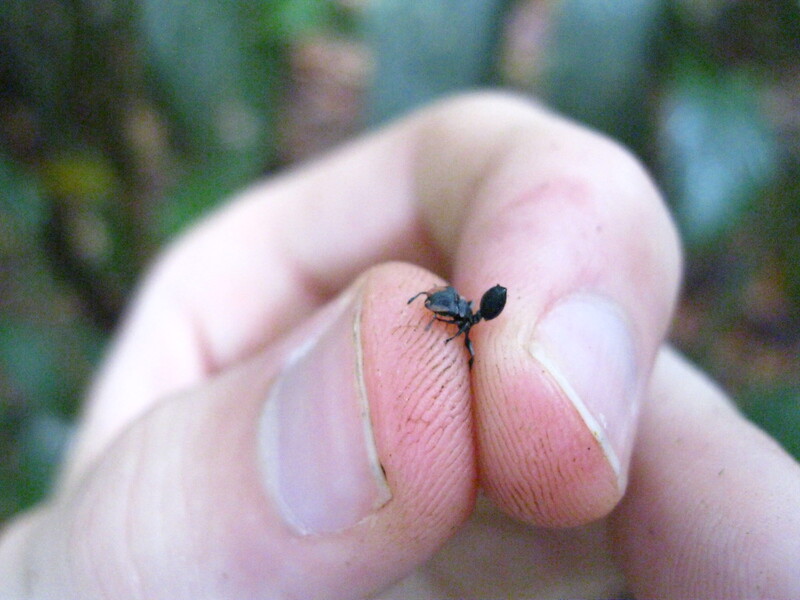 When this ant ran up the palm leaf it ran right by and through a sparse trail of the army ants. 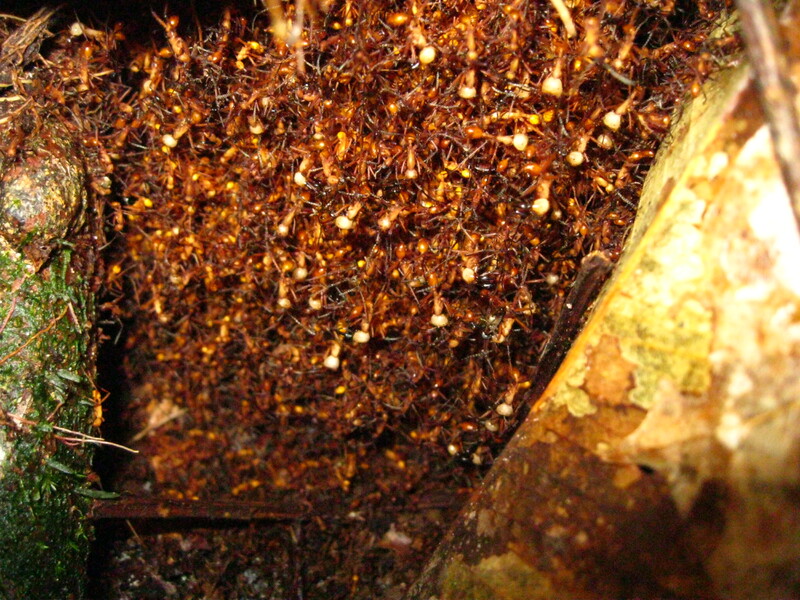 The Acromyrmex sp. worker carrying this brood was not as lucky (the brood itself was unluckier). At this point I decide to head back. 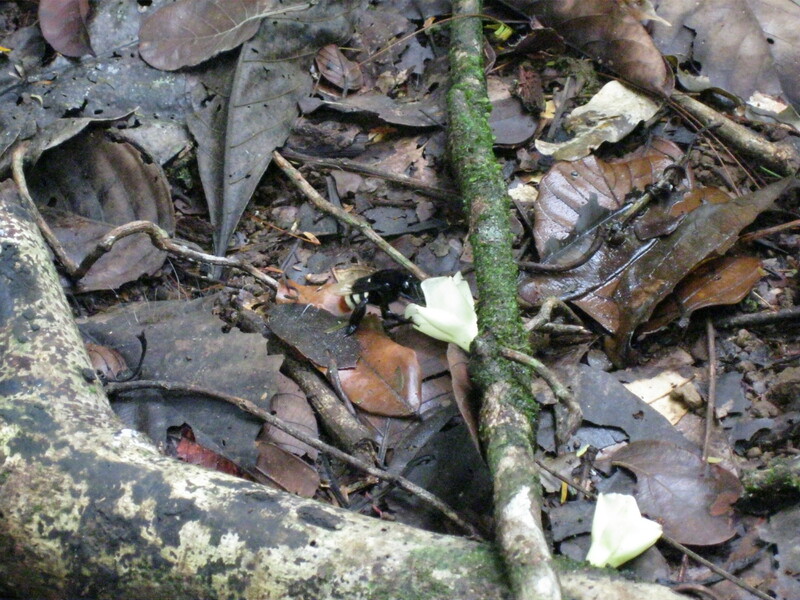 Several very large bees were around a recent branch fall, 2 meters from the bivouac.